In 2017, the total support from DMARC for all partner pantries in the DMARC Food Pantry Network was valued at $1,879,303*. DMARC provided partner pantries with 1,202,498 non-perishable food items with a wholesale value of $673,399 and $166,943 worth of fresh produce for distribution through our three-day monthly supply of food, a total value of $840,342. Additional food items provided, including extra non-perishable items, frozen meat, and dairy products, were valued at $400,055. Personal care products, toilet paper, diapers, and other non-food items provided by DMARC to partner pantries were valued at $88,155. The cost of DMARC overhead attributed to partner pantries had a value of $550,751. This includes staff, transportation, and technical expenses to support DMARC’s partner food pantries. In 2017, the total support from DMARC for IMPACT Ankeny was valued at $78,085*. DMARC provided IMPACT Ankeny with 50,332 non-perishable food items with a wholesale value of $28,186 and $6,287 worth of fresh produce for distribution through our three-day monthly supply of food, a total value of $34,473. Additional food items provided, including extra non-perishable items, frozen meat, and dairy products, were valued at $13,879. Personal care products, toilet paper, diapers, and other non-food items provided by DMARC to IMPACT Ankeny were valued at $8,618. The cost of DMARC overhead attributed to IMPACT Ankeny had a value of $21,115. This includes staff, transportation, and technical expenses to support the pantry. In 2017, the total support from DMARC for Bidwell Riverside Center was valued at $359,154*. DMARC provided Bidwell Riverside Center with 235,058 non-perishable food items with a wholesale value of $131,632 and $36,553 worth of fresh produce for distribution through our three-day monthly supply of food, a total value of $168,185. Additional food items provided, including extra non-perishable items, frozen meat, and dairy products, were valued at $54,617. Personal care products, toilet paper, diapers, and other non-food items provided by DMARC to Bidwell Riverside Center were valued at $13,585. The cost of DMARC overhead attributed to Bidwell Riverside Center had a value of $122,767. This includes staff, transportation, and technical expenses to support the pantry. In 2017, the total support from DMARC for Catholic Charities Outreach Center was valued at $140,467*. DMARC provided Catholic Charities Outreach Center with 80,152 non-perishable food items with a wholesale value of $44,885 and $12,595 worth of fresh produce for distribution through our three-day monthly supply of food, a total value of $57,480. Additional food items provided, including extra non-perishable items, frozen meat, and dairy products, were valued at $26,230. Personal care products, toilet paper, diapers, and other non-food items provided by DMARC to Catholic Charities Outreach Center were valued at $14,454. The cost of DMARC overhead attributed to Catholic Charities Outreach Center had a value of $42,303. This includes staff, transportation, and technical expenses to support the pantry. In 2017, the total support from DMARC for Central Iowa Shelter & Services was valued at $36,628*. DMARC provided Central Iowa Shelter & Services with 20,496 non-perishable food items with a wholesale value of $11,478 and $1,666 worth of fresh produce for distribution through our three-day monthly supply of food, a total value of $13,144. Additional food items provided, including extra non-perishable items, frozen meat, and dairy products, were valued at $13,632. 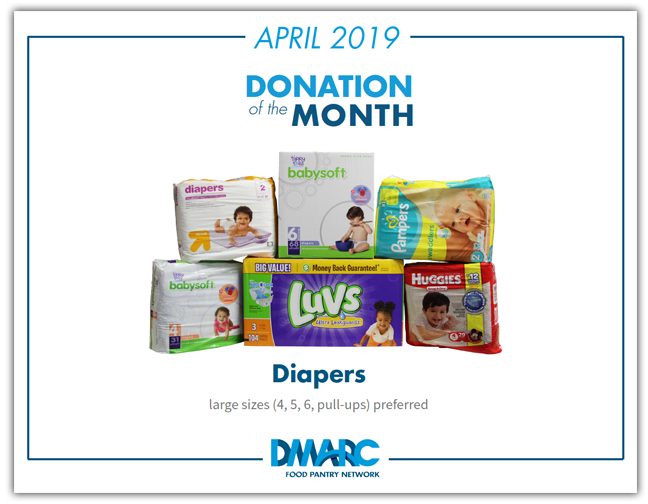 Personal care products, toilet paper, diapers, and other non-food items provided by DMARC to Central Iowa Shelter & Services were valued at $4,256. The cost of DMARC overhead attributed to Central Iowa Shelter & Services had a value of $5,596. This includes staff, transportation, and technical expenses to support the pantry. In 2017, the total support from DMARC for Clive Community Services was valued at $36,752*. DMARC provided Clive Community Services with 14,574 non-perishable food items with a wholesale value of $8,161 and $3,181 worth of fresh produce for distribution through our three-day monthly supply of food, a total value of $11,342. Additional food items provided, including extra non-perishable items, frozen meat, and dairy products, were valued at $11,063. Personal care products, toilet paper, diapers, and other non-food items provided by DMARC to Clive Community Services were valued at $3,661. The cost of DMARC overhead attributed to Clive Community Services had a value of $10,685. This includes staff, transportation, and technical expenses to support the pantry. In 2017, the total support from DMARC for Drake Area Food Pantry was valued at $172,180*. DMARC provided Drake Area Food Pantry with 139,778 non-perishable food items with a wholesale value of $78,276 and $16,563 worth of fresh produce for distribution through our three-day monthly supply of food, a total value of $94,839. Additional food items provided, including extra non-perishable items, frozen meat, and dairy products, were valued at $19,588. Personal care products, toilet paper, diapers, and other non-food items provided by DMARC to Drake Area Food Pantry were valued at $2,124. The cost of DMARC overhead attributed to Drake Area Food Pantry had a value of $55,629. This includes staff, transportation, and technical expenses to support the pantry. In 2017, the total support from DMARC for Johnston Partnership Place was valued at $59,252*. DMARC provided Johnston Partnership Place with 28,946 non-perishable food items with a wholesale value of $16,210 and $6,481 worth of fresh produce for distribution through our three-day monthly supply of food, a total value of $22,691. Additional food items provided, including extra non-perishable items, frozen meat, and dairy products, were valued at $12,342. Personal care products, toilet paper, diapers, and other non-food items provided by DMARC to Johnston Partnership Place were valued at $2,451. The cost of DMARC overhead attributed to Johnston Partnership Place had a value of $21,768. This includes staff, transportation, and technical expenses to support the pantry. In 2017, the total support from DMARC for Polk County Northside Food Pantry was valued at $78,383*. DMARC provided Polk County Northside Food Pantry with 44,390 non-perishable food items with a wholesale value of $24,858 and $4,537 worth of fresh produce for distribution through our three-day monthly supply of food, a total value of $29,395. Additional food items provided, including extra non-perishable items, frozen meat, and dairy products, were valued at $28,701. Personal care products, toilet paper, diapers, and other non-food items provided by DMARC to Polk County Northside Food Pantry were valued at $5,049. The cost of DMARC overhead attributed to Polk County Northside Food Pantry had a value of $15,238. This includes staff, transportation, and technical expenses to support the pantry. In 2017, the total support from DMARC for Polk County River Place Food Pantry was valued at $78,383*. DMARC provided Polk County River Place Food Pantry with 219,380 non-perishable food items with a wholesale value of $122,853 and $25,030 worth of fresh produce for distribution through our three-day monthly supply of food, a total value of $147,883. Additional food items provided, including extra non-perishable items, frozen meat, and dairy products, were valued at $92,032. Personal care products, toilet paper, diapers, and other non-food items provided by DMARC to Polk County River Place Food Pantry were valued at $9,649. The cost of DMARC overhead attributed to Polk County River Place Food Pantry had a value of $84,064. This includes staff, transportation, and technical expenses to support the pantry. In 2017, the total support from DMARC for Salvation Army Citadel was valued at $148,566*. DMARC provided Salvation Army Citadel with 103,620 non-perishable food items with a wholesale value of $58,027 and $12,766 worth of fresh produce for distribution through our three-day monthly supply of food, a total value of $70,793. Additional food items provided, including extra non-perishable items, frozen meat, and dairy products, were valued at $26,770. Personal care products, toilet paper, diapers, and other non-food items provided by DMARC to Salvation Army Citadel were valued at $8,128. The cost of DMARC overhead attributed to Salvation Army Citadel had a value of $42,875. This includes staff, transportation, and technical expenses to support the pantry. In 2017, the total support from DMARC for Salvation Army Temple was valued at $37,158*. DMARC provided Salvation Army Temple with 26,468 non-perishable food items with a wholesale value of $14,822 and $2,930 worth of fresh produce for distribution through our three-day monthly supply of food, a total value of $17,752. Additional food items provided, including extra non-perishable items, frozen meat, and dairy products, were valued at $7,396. Personal care products, toilet paper, diapers, and other non-food items provided by DMARC to Salvation Army Temple were valued at $2,169. The cost of DMARC overhead attributed to Salvation Army Temple had a value of $9,841. This includes staff, transportation, and technical expenses to support the pantry. In 2017, the total support from DMARC for Urbandale Food Pantry was valued at $206,366*. DMARC provided Urbandale Food Pantry with 134,546 non-perishable food items with a wholesale value of $75,346 and $21,031 worth of fresh produce for distribution through our three-day monthly supply of food, a total value of $96,377. Additional food items provided, including extra non-perishable items, frozen meat, and dairy products, were valued at $37,015. Personal care products, toilet paper, diapers, and other non-food items provided by DMARC to Urbandale Food Pantry were valued at $2,340. The cost of DMARC overhead attributed to Urbandale Food Pantry had a value of $70,634. This includes staff, transportation, and technical expenses to support the pantry. In 2017, the total support from DMARC for West Des Moines Human Services was valued at $126,102*. DMARC provided West Des Moines Human Services with 70,762 non-perishable food items with a wholesale value of $39,627 and $13,218 worth of fresh produce for distribution through our three-day monthly supply of food, a total value of $52,845. Additional food items provided, including extra non-perishable items, frozen meat, and dairy products, were valued at $31,038. Personal care products, toilet paper, diapers, and other non-food items provided by DMARC to West Des Moines Human Services were valued at $7,773. The cost of DMARC overhead attributed to West Des Moines Human Services had a value of $34,447. This includes staff, transportation, and technical expenses to support the pantry. In 2017, the total support from DMARC for the Mobile Food Pantry was valued at $66,524*. DMARC provided the Mobile Food Pantry with 33,996 non-perishable food items with a wholesale value of $19,038 and $4,105 worth of fresh produce for distribution through our three-day monthly supply of food, a total value of $23,143. Additional food items provided, including extra non-perishable items, frozen meat, and dairy products, were valued at $25,695. Personal care products, toilet paper, diapers, and other non-food items provided by DMARC to the Mobile Food Pantry were valued at $3,898. The cost of DMARC overhead attributed to the Mobile Food Pantry had a value of $13,789. This includes staff, transportation, and technical expenses to support the pantry.